I'm a lover of good food. And of SW Michigan. And of shopping small. And of artisan-made products. 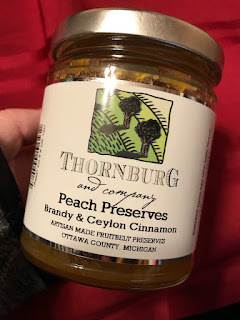 So, when Thornburg & Company asked if I'd like to sample a couple of their products and see what I could do with them, I happily agreed. 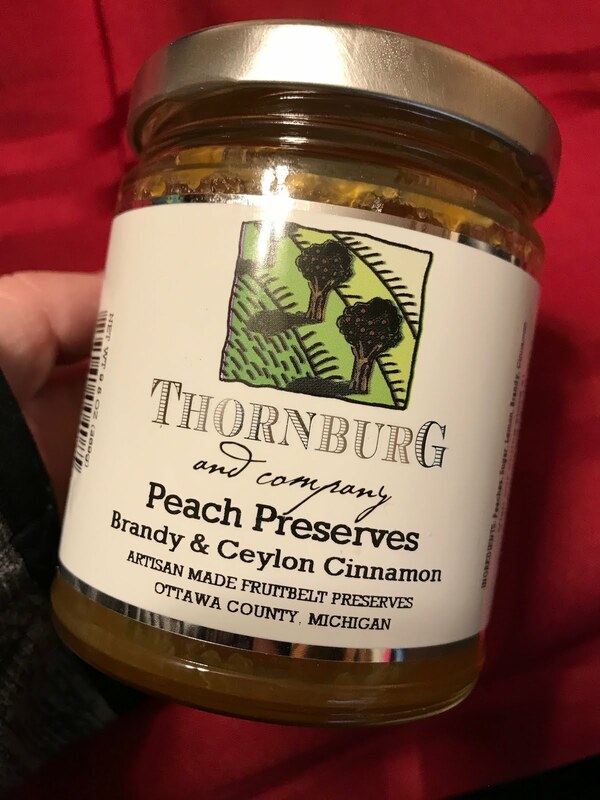 I received two different preserves. One was Peach Preserves with Brandy & Ceylon Cinnamon. I'm also a fan of recipes that are super duper easy and it doesn't get much easier than cooking in a crock pot. Pork and peaches are a combination that I really love. 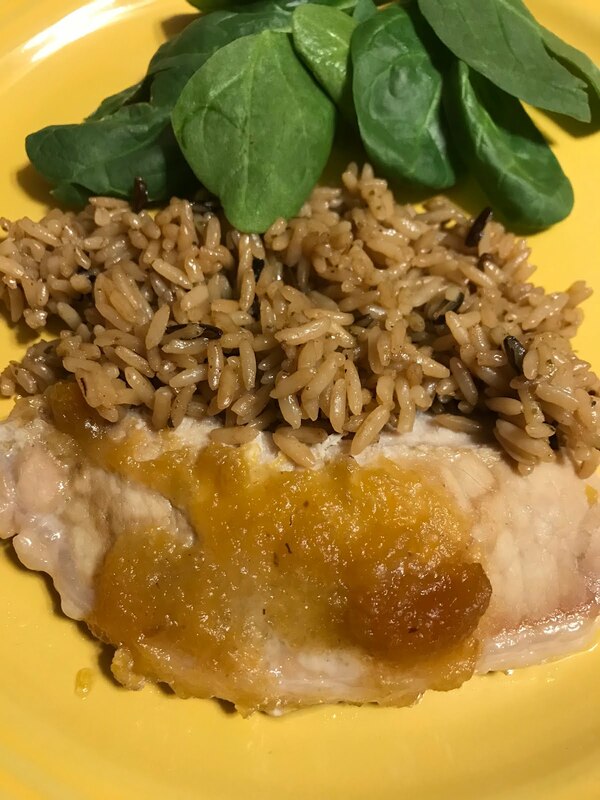 So, when I got the peach preserves to try in the mail, I knew that the first thing I would want to do with them was make some crock pot pork chops. The flavors from the preserves meant nothing else was necessary. I simply placed my pork chops in my rectangular crock pot (I highly recommend this if you don't have one! Great for casseroles or odd sized pieces of frozen meat that don't fit in the traditional round ones.) I added a little bit of water (less than a 1/4 cup) to the bottom. The crock pot went on high for three hours, then I moved it to low for another hour. 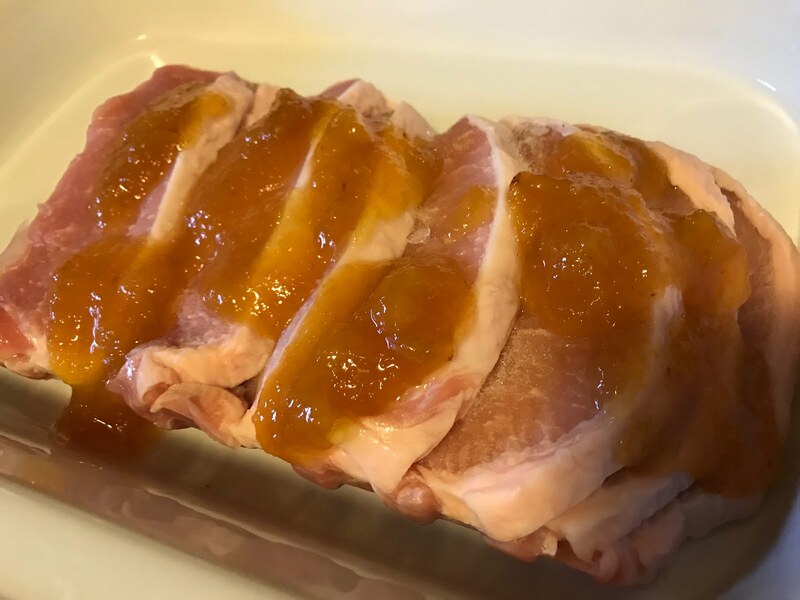 Crock pot pork comes out so tender and the preserves added wonderful flavor - a bit of sweet to add to the savory meal. I added a scoop of brown long grain wild rice (a quick microwave pack that was done in 90 seconds) and some fresh spinach with a drizzle of balsamic and I was done. Preserves can be used for a lot of things besides spreading on white toast. The other jar was used as part of a panini and I'll be sharing that recipe soon. Check out Thornburg and Company online at ThornburgandCompany.com and also follow along on Instagram and Facebook. I love that they utilize locally grown produce in their products. Is there anything better than a Michigan peach???? I see that they have Blueberry Preserves with Pinot Noir and Lavender and it sounds amazing. I'm sure that the Whiskey Barrel Aged Michigan Maple Syrup is phenomenal, as well. Take a minute to scan through their unique products and think about what you could make with them!